My easy Gluten Free Shepherd’s Pie is a classic British recipe that’s a firm favorite in our house and perfect comfort food any time of the year! It’s traditionally made with ground lamb back home in the UK. But, here in the USA ground beef seems to be the more popular way to make an easy Shepherd’s Pie. Whatever you choose to use will work really well for this recipe, it’s tasty either way! It can easily be made dairy free if you omit the cheese topping, or opt to use vegan cheese instead. My first tip is to make sure that you saute the onions and carrots first, it brings out the natural sweetness of the vegetables and just adds to the overall flavor of the dish. Don’t skip browning the lamb or beef either, it also helps dramatically with the flavor and to get that lovely Maillard reaction going on! Ground lamb does tend to have quite a lot of fat so I skim some (but not all, it adds to the flavor) of it off after I brown it. If you use ground beef then you may or may not need to skim some fat off after browning depending on the fat content of the meat. I would urge you to use caution and NOT pour all the lovely juices down the sink as you’re pouring away the flavor! I like to thicken the meat sauce so I usually add a little cornstarch slurry mixture to the meat and sauce to thicken it up. You can omit this step if you are Paleo or W30, or use Arrowroot or Tapioca Starch instead. If you want to freeze this my tip is to make up the meat portion of the easy shepherds pie and freeze that part only, potatoes don’t freeze very well and tend to go soft and spongy when defrosted. If you want to reheat your easy Shepherd’s pie you can easily do that by reheating it in a warm oven, or simply use the microwave. 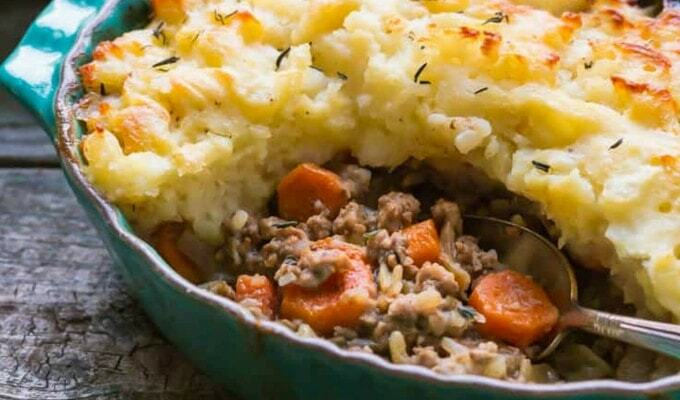 Where does Shepherd’s Pie come from? Shepherd’s Pie is a quintessentially British recipe that’s commonplace back home. I grew up eating it on a regular basis and it remains a firm favorite on many Gastro Pub menus for good reason! 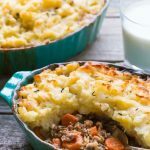 It’s really easy to prepare shepherds pie, the ingredients are relatively inexpensive and it requires no great culinary expertise in order to make it, it’s perfect comfort food! 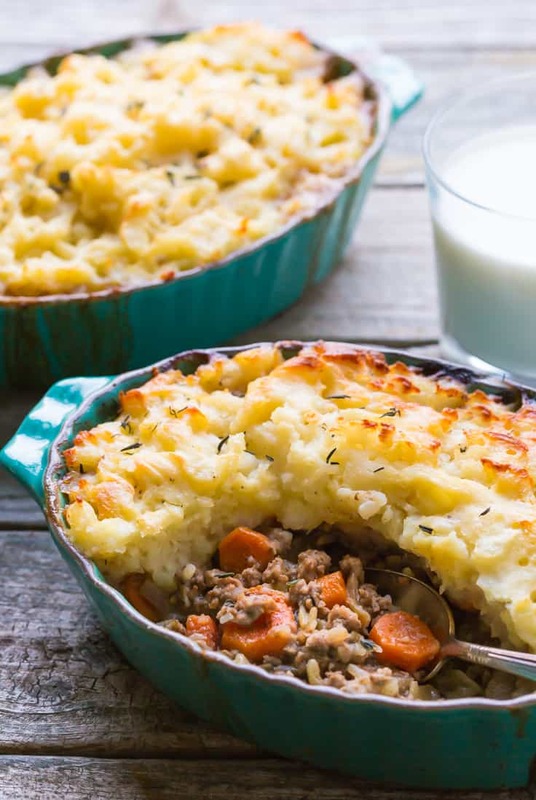 What is the difference between Cottage pie and Shepherd’s pie? 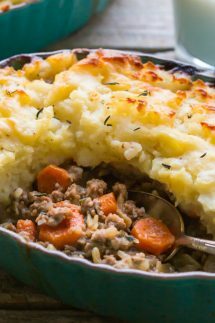 Any self respecting Brit knows that Cottage pie is made with ground beef, and Shepherd’s Pie is made with ground lamb or mutton. 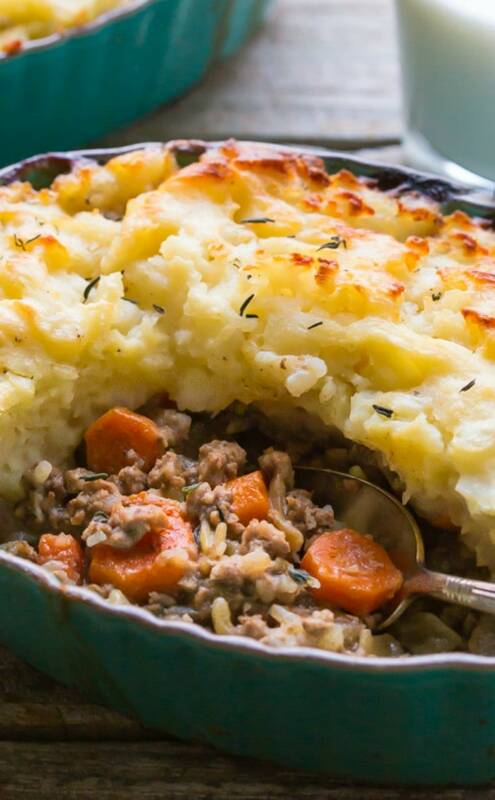 After all, Shepherd’s look after sheep so it makes sense that Shepherd’s Pie is made with lamb! There can be some regional variations in terms of the vegetables added, though they are usually very simple and include carrots, onions, and/or garden peas, and then the pie is topped with potatoes. Back in the day Cottage Pie would sometimes be made with slices of potatoes on top, and Shepherd’s Pie would traditionally have mashed potatoes. But they are pretty much interchangeable these days and I think most people just add mashed potatoes to both. 8×8 pan – If you don’t want pans like the ones I’ve used then an 8×8 ceramic pan will work just as well instead. Paleo Beef Broth – I’ve found it really hard to find Paleo Beef Broth locally, so when I need it I buy online or make it myself. Arrowroot Powder – If you’re following the Paleo Diet then Arrowroot Powder is a great alternative to using cornstarch to thicken gravies and sauces. Worcestershire Sauce – I love this for adding to sauces, if you live in the USA then most brands of Worcestershire Sauce are gluten free but this is not always the case so do check the label! An easy to cook recipe for delicious winter comfort food, Easy gluten free Shepherds Pie, can easily be paleo or Whole 30 too. Don't forget to watch my short recipe video! You'll find it just below the recipe directions. For Whole30 - omit the butter in the potatoes and do not add cheese, no Worcestershire sauce either. For Paleo omit the Worcestershire sauce and add butter and cheese if that works for you. Heat the oil in a pan and add the onion and carrots and gently saute for a 3 - 4 minutes. Add the lamb or beef and brown over a medium heat, stirring all the time, spoon off excess fat if necessary. Add the tomato purée and Worcestershire sauce if using it, then fry for a couple more minutes. Add the beef stock, bring to a simmer, then cover pan and cook for about 20 minutes. After 20 minutes uncover the pan and continue to cook for 20 more minutes. While the meat is cooking, boil the peeled potatoes in slightly salted water for 10-15 minutes until soft, but not soggy. Drain, then mash together with the butter. If after reducing the cooking liquid you think it's too runny to add to the baking dish you can add some arrowroot starch to thicken, cornstarch works too (it's gluten free) but of course that's not Paleo. Add two tablespoons of arrowroot to a cup with a 3-4 tablespoons of cold water and mix well. Remove the pan from the heat and add half of the starch mixture to the meat, stirring to avoid lumps and give it a few minutes to thicken up, add more if you need to. Put the cooked meat mixture into an ovenproof dish over with the mashed potatoes and spread out with a fork, add shredded cheese on top if you like. Place dish on a baking sheet and bake for 20-25 mins until the top is starting to colour and the meat gravy is starting to leak out around the edges. You will need an 8x8 oven proof dish to bake this in. This looks delicious! I’ve always wanted to try dairy-free shepherd’s pie and just never had the courage to do it! Can’t wait to try this recipe! And wow! Mississippi must be a big change from Scotland! Thanks Hunter! Mississippi is a HUGE change from Scotland for sure. I hope you try the pie, it’s really easy to make and my kids were asking for more which was nice to hear. Growing up in New England, Shepherds Pie was a fall/winter staple. I now live south of the Mason Dixon line and still make it during the colder months (Dec, maybe Nov.~Feb). I am looking forward to trying your recipe. I am also looking forward to making some of the Gluten Free cookies (and other goodies) on your site. Recently my doctor asked me to go GF b/c of inflammatory issues. I thought my life was over! Bread, crackers, cereal and muffins are (well were) a permanent fixture in my pantry…Thank you for sharing! Hi Hedy! It’s hard to change the way you eat and it does take a bit of getting used to! I now eat a lot less carbs than I used to as I found I feel better that way, but I do love to bake from time to time and have enjoyed making gluten free cakes and cookies for the family. Your shepherd pie looks amazing. My boyfriend is a big fan of shepherd pie so I’m contemplating to make this for him as a surprise as preparation looks easy enough. I’ve never heard of arrowroot powder though. Is it gonna make a difference if I just use corn starch? I made this last night and the whole family loved it! I did add a few things to make it my own – to the filling some A-1, seasoned salt, chopped garlic, and garlic powder. To the potatoes I added garlic powder, dried basil and parsley. I did put cheese on half of it as my family does not have a gluten or dairy intolerance like I do. They hubby liked it so much he had 2 servings and got into the leftovers already lol. This is definitely a keeper to be added to our regular winter rotation. I do think I might try adding some peas next time. I’m wishing I’d doubled the recipe so I had more leftovers today! Hi Danyelle, I’m so glad your family loved it and your recipe tweaks sound great! Every time I make it there’s never any left here either, my children love it! Made this last night and everyone loved it! Plus it was pretty easy and inexpensive to make. We used instant mashed potatoes (gluten free with coconut milk) instead because I was just too lazy to cook potatoes lol. Thanks for the great recipe – it’s definitely going in the regular rotation! Hey Erin, so glad you loved it!! I hear ya on the potatoes,lol, sounds like a great idea to do that instead of peeling them. I made this dish with ground chicken as the meat. I added various seasonings to it to boost its flavor though. It worked very well. I also added dried basil and ginger powder to the potatoes. I used vegetable stock instead of beef stock. And I used a little baslamic in place of the Worcestershire sauce. I was out to make a bunch of changes, it just so happened. Anyway, it was great! My 5-year old son begged for more and asked me to make it again soon. I made shepards pie for the first time tonight using your recipe and it was a huge success!!! Things I learned: Not a recipe to make in April when it’s 76 degrees out. Not to be started at 6:30 pm. Not cheap to make all organic and grass fed. I added green beans. Super yummy though! Thank you for a great experience making something new. Hi Alison, so glad you liked it! Yes, organic and grass fed is very spendy and costs a lot, I don’t buy it very often. Thank you for sharing! My girlfriend had celiac as well, it wasn’t something we had actually had together yet. It was super delicious!! How well do you think this would freeze? This looks so yummy. Hi Tara! So in my experience cooked potatoes do not freeze well, they kind of turn to mush and take on a funky grey color. It’s all still edible, but I just don’t like they way they are after they defrost, my kids will still eat it though! You could just make the meat pie part and freeze that separately, it should freeze without any problem. This is not Paleo if it’s got potatoes unless it’s sweet potatoes. Hi Polina, white potatoes are real food and lots of paleo people will eat them while others will not, it’s really up to you. I bet it would be delicious if you substituted sweet potatoes for the white potatoes. If you give it a try, let us know how it turns out! I’m trying the recipe tonight with yellow potatoes. My nice round pan broke, so I’m debating whether the deep dish pie pan will be too small or if I should use the rectangle pan. Anyway, thanks for the recipe! I made this last week with sweet potatoes! It was amazing! This is my “go to” dinner recipe it is ALWAYS a hit. I made it for my parents and my Mom asked for the recipe. Love,libe, love it! Thank you for sharing this recipe. My mother and I enjoyed eating it – so savoury! Note: this recipe produced WAY more than four servings, but this was not a problem because there were plenty of leftovers. I made this tonight and my family really enjoyed it. I was happy I doubled the recipe for lunch tomorrow. My littlest is pretty picky but loves her meat and she just devoured this. Thanks for sharing. Holy heck, this was fantastic! Total creamy comfort food. I made this tonight with a buttery cauliflower puree in lieu of potatoes and topped it with cheese as you suggested. Yes, it’s 105 degrees here and I’m sweating my a** off in the kitchen but it was so worth it. Thanks! Hi Wendy, I’m so glad you liked the recipe! I laughed at your comment about cooking with the oven in the heat, I do that all the time! And I drink hot tea every day (I’m British..) even during the Mississippi summer heat, lol! So in the picture, it looks like there is rice in the meat mixture. Am I just seeing things? It looks delicious; definitely going to try it soon. You’re right it does look like rice! but I never use that in the recipe so I’ve been staring at it for the last three minutes trying to figure it out and I’m 99.9% sure it’s finely chopped onion/and or garlic. I made this last night and it was absolutely delicious! I did add a few modifications. I sautéed in 4 cloves of minced garlic right before adding the ground beef. Instead of using all broth I used about a quarter cup of red wine for a portion of the liquid. I did end up thickening it with some corn starch. I did not peel my red potatoes but instead diced them small. I also added some chopped parsley, heavy cream and a little bit of grated Parmesan to the mashed potatoes. My family loved it! A solid recipe you can adapt to your liking. Hi Katie, I’m so glad you liked it and your adaptations sound fabulous!! I’m so glad you liked the recipe! Is tomato purée tomato sauce or paste or something else? Hi Emily, It’s the same as tomato paste. I was diagnosed with Celiac 5 years ago, and my sister and her family often do Whole 30. I tried this recipe today, and loved it. I used beef and baby carrots because that’s what I had in my fridge. I had previously considered making this with instant potatoes for ease, and you probably could do that if you didn’t have fresh or just didn’t want to peel and boil potatoes. I think next time I will try mashed cauliflower. My mother was recently diagnosed with colon cancer, and we’re trying to avoid starches. Hi Amanda, so glad you liked it! I think cauliflower would be a great option too. I hope your mother will make a full recovery, I know that’s a hard thing to deal with. Delish! Left out Worcestershire sauce since I now know mine is not GF. Used only half the broth and didn’t have to use tapioca either. Also made it a loose pie by making all things that go in the pie separate. So meat was in its own pan as were the carrots, peas, corn and mashed potato. With five kids I’ve got too much variety in dislikes to mix everything together. Tasted more sloppy joe-ish without Worcestershire but still great! Kids liked the pick what you like method. Even made some mashed sweet potato! So glad it worked for you! I love how you tweaked it to fit all your kids tastes! This was soooo good! I made “fresh” chunky mash, using sweet potato and russet, with skin on, and used ground turkey for the protein. Also added frozen peas and white corn to the meat mixture. I have made a lot of different Shepherd’s pie, and this is one of the best versions! Love this! Super delish! I made a fresh chunky mash using russet and sweet potato with skins on,; added peas and white corm to the meat mixture. Extra Worcestershire sauce (lea and perrins in US is GF). I have made a lot of Shep pie, and this is one of my fav!! This was my first time making shepard’s Pie and my family and I loved it! Amazingly my picky 4 year old kept asking for more! That’s a HUGE compliment!!! Your recipe was perfect for our family of 3 with leftovers for hubby’s lunch. Thank you so much! This was delicious! It’s a regular staple at our house. I’m so glad you like it Sarah! Do you think I could omit the tomato paste? I am allergic to tomatoes and am trying to think of a substitute! Thanks for your thoughts in advance! I am from Mississippi as well so I am sure you have discovered the struggle of being gluten free in the South! Hi Victoria! Yes you can omit the tomato sauce completely and it should still taste great. this one looks good and yummy for dieters like me….i must try this one of these days. thanks Sheena for sharing. You’re welcome Merwin, I hope you like it! I made this for dinner for Pi day. IT was very tasty. I did add a bit of sour cream to the mashed potatoes before spreading them on the meat mixture since they seemed a bit dry.